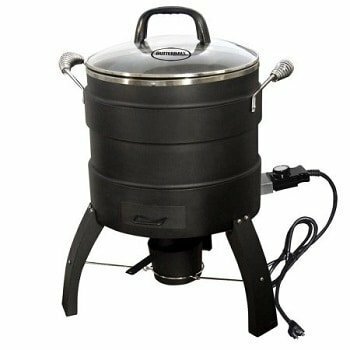 If you love the delicious taste of home fried turkey but not the frying in hot oil part, then the oil free electric turkey fryer would be your ideal home turkey cooker. The oil free turkey frying machine, just like the smaller size hot air fryer, fries without the need for oil. It is a safer and healthier alternative to deep frying using a pot of boiling oil. Is the oil less home turkey fryer for you? What comes to mind – taste? hassle-free? safe? affordable? really healthier? Let’s check it out together. You can collect drippings to make sauces. Do take note that drippings have to be heated up ( 180 degrees F ) on your gas stove before using. Takes longer to cook the turkey compared to the fryer using oil – 10 minutes per pound for the oil free cooker compared to the 3 – 4 minutes per pound for the other one. You need to heat up the fryer to the desired temperature before putting in the bird. This can take up to an hour. You cannot use the unit for boiling or steaming. The whole unit consists of a perforated basket inside the cooking chamber with visible heating element and an opening at the bottom for the drippings to flow out. This turkey cooker cooks by using radiant heat. It is a double wall construction fryer and makes use of radiant heat to sear the turkey skin and seal in the juices. You get a juicy, moist and flavorful turkey with crispy skin. The control panel knob with the cord is marked with low, medium and high settings. You set to high for turkey. The indicator light turns off when the desired temperature is reached. Then only you lower the turkey into the cooker. It takes about an hour to preheat the roaster cooker. The control knob comes with thermostat temperature control that prevents overheating your turkey. Measuring 18.15″L X 23.30″W X 26.14″H, it uses its powerful 1,650-watt electric element to create radiant heat to cook turkeys up to 18 pounds. An 18 pound bird takes about 3 hours to cook based on the 10 minutes per pound rule. Make sure frozen turkey is completely thawed in the refrigerator. It will take about 24 hours for every 4 pounds of turkey which means that a 16 lb frozen bird will take about 4 days to thaw completely. This outdoor oil free roaster fryer comes with a built-in wood chip box for that special smoky flavor. Presoak the wood chips for 30 minutes for a better smoky flavor. Using this is optional. A removable drip pan at the bottom of the fryer collects drippings that you can use to make flavorful sauces. However, do take note that the pan might be too shallow to collect all the fat. The perforated cooking basket allows for even heat circulation on the bird. Comes with glass lid with stay cool handle and vents to release smoke and steam. The bird is placed in a vertical position with the turkey stand inserted into its cavity. The turkey is then placed in the basket and the basket itself sits on the basket hanger. The infrared heating element is just below the bird. So, the turkey sits on the turkey stand which hooks onto the cooking rack that sits on the basket. The basket sits on the basket hanger which sits inside the cooking chamber. The internal meat thermometer has to be inserted 2″ into the deepest part of the breast. When cooked, the temperature reading should be 165 – 170 degrees Fahrenheit. The metal lifting hook is included and you use it to lift or lower the basket into the fryer. Stuffing the bird is not possible due to the way the bird is positioned inside the cooker roaster. Close the glass lid during the cooking process to maintain the cooking temperature. Besides turkey, you can cook other foodstuff such as chicken, fish, beef and pork roasts etc. as long as these food fits into the basket. The basket measures 7″ from the bottom of the basket to the rim, from the bottom of basket to the lid is about 11″ and has a diameter of 10″. For roasting fish, you’ll get better results if you first seared the fish on a pan sprayed with oil on your gas stove. Then only put the fish in the fryer basket and roast on high for about 10 minutes. The glass lid, cooking rack, turkey stand and basket can be cleaned using soft sponge and mild detergent. These are also dishwasher safe. The wood chip tray has to be cleaned too after each use so as to prevent the build up of ash. Compared to frying in oil, it is just as crispy and moist but a lot more less greasy. Compared to roasting in the oven, the meat using the oil less fryer is more juicy and tender. It is faster too compared to roasting in the oven. Roasting an unstuffed 14 lb bird in the oven will require 3 – 4 hours. A stuffed bird will take about 3.5 – 4 hours. Frying the 14 lb bird in the oilless turkey fryer by Masterbuilt will take about 2 hours 20 minutes. 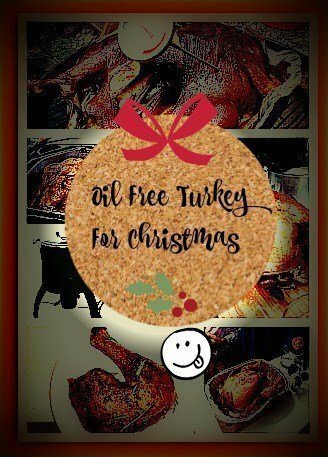 Using the electric oil free turkey cooker is hassle free. Since no oil is involved, clean up is quick and easy. There is no risk of getting scalded by hot oil. Infrared cooking system cooks by using radiant heat. Radiant heat cooking does not require the food to be in direct contact with the heat source. The far infrared heating element emits the waves of radiant heat in all directions to cook the food. The temperature of infrared heat is very high. The double wall construction prevents fires and flareups as well as ensures even cooking. The high heat helps create the searing of the meat, sealing in the juices. All meat has a moisture saturated boundary layer. The radiant heat is able to penetrate into the meat molecules without breaking up this layer. The meat remains juicy and moist. Yes, absolutely healthier compared to the one deep fried in oil. No oil is used in this oilless turkey cooker. Less fat equals less calories. Rubbing a bit of oil on the skin of the turkey before your dry spice rub would keep the skin crispy and the meat juicy and moist. Try to use low sugar rubs as the sugar can get burnt under high heat. Always remember to insert the meat thermometer 2″ into the thickest part of the breast meat before lowering the bird into the cooking chamber. When done, temperature should read a minimum 165 degrees F.
Before using the machine for the first time, you’ll have to burn off the manufacturing oil and smell. Rub the entire inner cooking chamber with vegetable oil, switch on the machine and let it be on until the oil has burned off and smoking has stopped. The interior walls will now be a dark brown color. To maintain the seasoned surface as well as to prevent rusting, rub the interior walls with vegetable oil each time after using it. 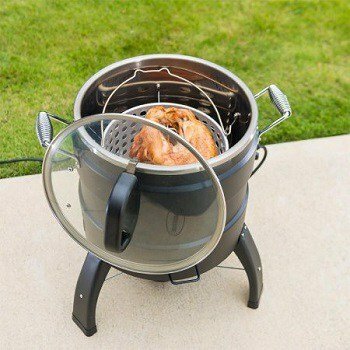 This outdoor electric oil free fryer roaster would be great to use during the summer months when using the indoor oven gets too hot and uncomfortable. If you are looking for a healthier alternative to frying your turkey in oil, then you should consider the Butterball oil less turkey fryer cooker roaster. Since no oil is added during the cooking process, instead turkey fat and drippings flow out, you’ll end up with a cooked turkey that has less fat than before you started cooking. With less oil in the meat, you will get a more intense turkey flavor. Radiant heat does not have a drying effect on the food thus the food remains moist and tender. With less oily mess to clean up and less likely to get scalded or burned by hot oil, cooking the Thanksgiving and Christmas turkey is now, certainly something to look forward to. If you and your family craves deep fried turkey and yet worry about the calories, then this radiant heat fried bird would appeal to you. However, this oil free turkey fryer roaster does seem less versatile compared to the Butterball indoor electric turkey fryer that uses oil. For the indoor fryer, you can also use it to boil or steam food stuff like crabs and lobsters. This outdoor oilless fryer can only be used for ‘frying’ and roasting. Although it has a higher price tag compared to the propane turkey fryers, you do get to save on expensive peanut oil in the long term. Besides, it is more healthy and just as tasty.